Before we delve into if-then planning, let’s quickly discuss what self-control is. There’s often a myth that in order to reach our goals, we can or have to rely exclusively on self-control. though, then when we try to use it, we often falter. and therefore, partially fatigue it. of sticking to a new habit. Here are the 5 steps to set up your If-Then planning. 1 – Think of an action you need to take to reach your goal (step #5 from up above). Example: You need to go to the gym and workout. 2 – Next, think of when and where you take that action. Example: After work and on Saturdays. 3 – What situation will normally cause you to not complete that action? Example: When I’m tired from work and come home before heading to the gym. 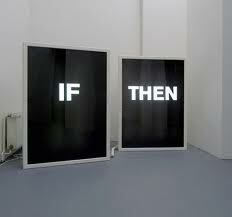 5 – Combine the two into an “If-Then” Statement. Example: If I’m tired from work, then I will head straight to the gym before going home. the night before and bring it to work with you or some other creative aspect that I haven’t thought of. Remember, by taking part in this if-then thinking you allow yourself to have a built-in self-control reserve and you allow yourself to build that “muscle” by doing things even when they’re not the most convenient.